The use of braces or orthodontics can effectively address issues regarding crooked teeth, improper bites, or malocclusion. Braces or orthodontics by a Kent dentist provide improvement in both the functional and aesthetic aspects of a person’s smile, with the treatment ideally done before more serious dental problems have a chance to develop. We at Woodbury Dental and Laser Clinic offer braces for all age groups (modified Inman Aligner Technology) combined with invisible power chain; this treatment can now achieve beautifully aligned smile in as little as 8 to 12 weeks. The use of dental braces or orthodontics is not just for children. Adults visit us at Woodbury Dental and Laser Clinic or orthodontists for many of the same reasons as children because the same oral problems, which affect children, can plague adults as well. There are some adults who may have had orthodontic problems as children, but are only now having them addressed; others who have had orthodontic treatment during their childhood may need further treatment as adults because of regression. Tooth loss is one of the causes for the need to have orthodontic treatment as an adult. The loss of any number of teeth can result to the shifting of the remaining teeth. It may therefore be necessary for the adult to have an orthodontist reposition the teeth, so the dentist at Woodbury Dental and Laser Clinic can then replace the missing teeth with prosthetic devices (such as a dental bridge, or dental implants). Orthodontics and the use of dental braces can also help patients who need to have periodontal (gum) treatment by shifting the teeth, so they are moved to a position where they can be supported with more healthy bone structure. Improved Aesthetics – Crooked or uneven-looking teeth can have a negative impact on how the smile looks like, especially if the teeth that are crooked are positioned in an area that is highly-visible when the mouth is opened/when one smiles. Teeth that are straightened and properly aligned vastly improve the appearance of a smile. Teeth Easier to Clean – Teeth that are properly aligned are much easier to clean, compared to crooked teeth that can result to places where regular tooth brushing or even dental flossing may not reach. When teeth are in their proper alignment, it is easier to maintain good oral health with regular cleaning practises. Less Stress on Teeth Enamel – Misaligned or crooked teeth can cause unnecessary friction between teeth surfaces when the upper and lower teeth come into contact with one another. Braces or orthodontics by the dentist at Woodbury Dental and Laser Clinic a Kent will effectively move teeth into the proper position, so that teeth enamel will not be worn unnecessarily due to teeth misalignment. Good Jaw Joint Health – Just like teeth enamel, the jaw joint also suffers from problems with misaligned teeth. Good jaw joint health can be achieved and maintained with the help of braces or orthodontics, which moves the teeth into a properly aligned position. Inman Aligners are a type of orthodontic appliance that can move or straighten teeth to the desired position. The dentist at Woodbury Dental and Laser Clinic use the Inman Aligner as an alternative to the Invisalign invisible braces system. 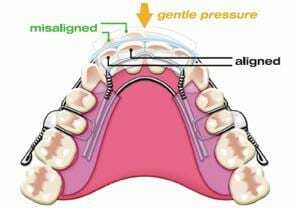 The aligners used in the Inman Aligner system are restricted to the level of movement that they can achieve, and will generally have better results on misalignments of the lower and upper front teeth. However, Inman aligners are not suitable for some cases – for example, where the teeth are heavily crowded. After a thorough consultation, your dentist will be able to determine if you are suitable for treatment with the Inman Aligner. Unlike the Invisalign system, the Inman Aligner is not completely clear and has a visible metal bar that can be seen across the front of the teeth. The Inman Aligner, however, does have a lot of the same benefits as the invisible braces system (Invisalign). The Inman Aligner is a removable dental appliance that is used to move the teeth over time. The forces that move teeth into the desired position are created by a coiled spring on the lingual side of the aligner (positioned on the back of the teeth), and a bar that is positioned across the front of the teeth to “squeeze” the teeth into position through both a “pushing” and a “pulling” movement. How long does treatment with the Inman Aligner take? Treatment times with the Inman Aligners are generally shorter compared to most invisible braces systems, with treatment times varying from six to 16 weeks. The time frame of the results is highly dependent on how long you wear the appliance for each day. With the Inman Aligner you can take the appliance off; however, the longer you wear it, the quicker you will be able to see the results. It is recommended that you wear the aligner for around 20 hours each day, every single day, if possible. Shorter treatment times compared to invisible braces. Aligners are removable – you can eat or clean teeth without any difficulties during treatment. Lower treatment costs compared to invisible braces. Only one Aligner will be needed for the entire treatment.